But boy am I annoyed at the German grandparents I never met. I mean, really. They have a lot of nerve. Just plain inconsiderate, I say. Can you tell yet that I had absolutely no luck while I was attending the Salt Lake Institute of Genealogy (SLIG) in finding that one critical missing record I most wanted to find at the Family History Library? You see, I grew up thinking my father was an only child. That’s what he’d said and, I suppose, in most of the ways that mattered to him in his life, it was true. The problem is that it wasn’t quite true. He wasn’t an only child; he was simply the only surviving child. 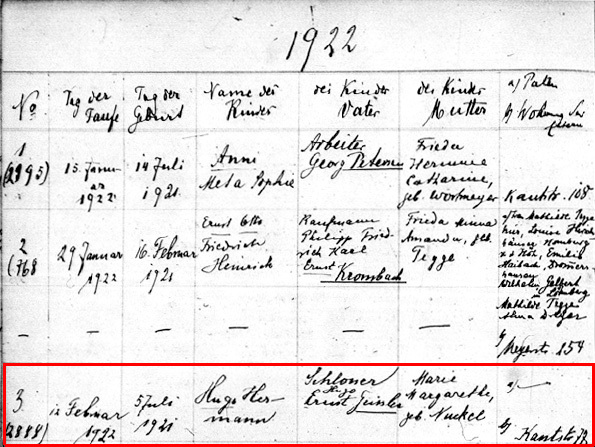 And oh… oh man… did I ever want to find the baptismal record of his one and only sibling, an older sister, who died 93 years ago, in January 1920, at the age of four months and 10 days. And that is literally all I know about her. Birth records in Germany are sealed for 110 years. I can’t find an exception in the law for immediate relatives (I’m as immediate as it gets in this family since my grandparents and father are all dead), nor can I find an exception if the person herself is deceased.3 So, as far as I know, I can’t get her official birth record. Death records, however, are now available 30 years after death, so I should be able to get her death certificate — but anyone who’s tried to pay for an official record from Germany, as I have, knows how hard it is to deal with the fees and bank transfers and and and… Still, I am going to order it or, better yet, go get it myself if I can find some room in both my schedule and my budget. But the church records of her baptism should be good for the getting. There’s just one hitch. I don’t know where she was baptized. I don’t even know for certain that she was baptized. I thought perhaps my grandparents would have had her baptized in the same church where they had my father baptized. So I was absolutely thrilled when I was at SLIG to discover that the church books for the Zions Lutheran Church (Zionskirche) in Bremen, where my father was baptized in 1922, had been microfilmed for the years 1898-1958. All week at SLIG I had dutifully studied German research techniques (when I wasn’t teaching in other classes or venues, that is). Or I was looking up other records for future lectures. Finally, on my last day there, one day before the 93rd anniversary of Marie’s death, I simply put everything aside, went down to the German floor, found the roll of microfilm and carefully loaded it into the microfilm reader. The baptisms (Taufen) were filmed in reverse order, newest to oldest. I cranked quickly backwards from 1958 through the 1950s, 1940s, 1930s and into the 1920s. I slowed down. 1929. 1928. 1927. 1926. 1925. 1924. 1923. 1922. Still, I already had that information. That wasn’t the baptismal record I was after. Back through 1921. Carefully through 1920. The winter. The fall. The summer. The spring. March. February. January. Not there. Now really, Grandma and Grandpa I never met, you couldn’t have had your daughter baptized in the same church where you had your son baptized? You’re going to make me wait until 2029 to see if it was mentioned in her birth registration? Or search through every church record in the entire city of Bremen once they become available, which may not be until after 2029 anyway? How very rude of you. So if you have documentation of the deaths of the both parents and the child, you should be able to obtain access to the birth information of the child. Thanks, but I don’t find that provision in the law itself. 1. Baptism sponsors should have been recorded on your father’s record. In the films I’ve looked at, the columns continued on the right side of the open book with sponsors, confirmation notes and even death or emigration & transfer notes. Apparently the right-hand pages of this register were not filmed; they are not mentioned in the film notes. A look at the original register might be of use. 2. At 4 months of age at death, Marie should have been baptized. Entries in the expected time frame would show what was usual for Bremen in the early 1900s (probably less than 2 weeks of age). The other entries might also show a date gap, perhaps due lost entries or a pastoral vacancy. 3. Zionskirche was established as a filial church of St. Pauli, perhaps Marie’s record is there. 4. If you have an earlier address (from addressbooks, marriage record or other sources), you might be able to narrow down the likely Evangelisch (Lutheran) parish. Caveat: I have German ancestry, know the language and have done research in German church records. However, I don’t know Bremen and its particular records. 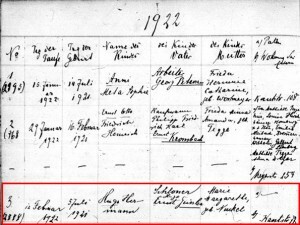 In my family the length of time to baptism was usually longer (my father, her younger brother, was seven months old, for example), but looking at St. Pauli’s records is a GREAT idea, and I will certainly try to get access to the original baptismal register for my father to get that right hand page! Thanks!! Thanks, Nick, and yeah… what a pain! This is a case where I’d be awfully happy for these folks to have been Catholic where I’d have a better chance that she was baptized. Lutherans weren’t quite as much the sticklers over that point. Good luck in finding your folks! You might get lucky if you know of any relative named Emma or Marie [other than Mom of course] as the godparent/sponsor could be the namesake as well. Not sure if such was the case in Germany, but in NY the German Lutherans did not always baptize all their children in the same church. [In fact at times it seems they capriciously hopscotched around for no other reason than to frustrate us later.] They may have used a godparent’s church. Valerie, the only Marie’s I know of in Bremen are this baby and her mama. And Emma was Hugo Ernst’s mother, who lived in Thuringen, not Bremen. Arrrggggh. Very frustrating! I hope that Yvette’s offer nets you the records. Is it possible they had her baptized in Thuringen? Is it possible that for some reason Maria was dropped and she is listed as Emma? Thanks, Keith. I don’t think it’s likely she would have been baptized in Thuringen, but it’s certainly possible and if I come up totally empty in Bremen, I will certainly try Gera where the father’s family was living. As for the name, nope, I went entry by entry through the baptisms and she’s not there under any name. I had the same problem with my father, he said he was the only son, then after he died in 2000, I find out he had a brother who died in World War II. I will never understand why he wanted to keep this a secret. Hope you have better luck and don’t have to wait until 2029. Wow… I wonder if it was just too painful for him to talk about his brother, Gus. Here, at least, my father was born after his sister died, so he would never have known or lived with her. Since your blog has been so helpful for me, I thought I’d see if I can help you with this problem. My specialty is Dutch genealogy, not German genealogy, but I have some experience researching my own German ancestors. The regulations in the Netherlands and Germany are similar so I know my way around a bit and since I speak German I thought I’d take a shot. Anyway, a found a page on the Bremen city website that explains their regulations for ordering birth, marriage and death records. It says that birth records older than 110 years can be ordered from the city archives and records younger than that can be ordered from the municipality. They are only available for the person themselves, their parents, grandparents, children or grandchildren. Siblings may order records if they explain their interest. I think you could make a good case why you can act instead of a sibling. I would advise you to order both the death record and the birth record, so they can see that this girl actually died as an infant so there is no problem with privacy and you are the next of kin (and you probably want the death record anyway!) I also advise you to send a letter explaining your request. This is the order form for the records. Payment is 10 euros per records, payable by sending cash, a check or by bank transfer after they send you a bill. If you want, I can handle the letter and ordering for you and you can reimburse me for the 20 euros through Paypal. Just contact me via e-mail or the contact form on my website and we can get the details sorted out. Yvette, that’s an amazingly helpful offer, and I’m definitely going to take you up on it. Thank you so very much, and I’ll follow up by email. I understand your “pain.” I have a set of great great grandparents, who for some unknown reason, only listed a country for a place of birth. Their children, they had 10 children that lived to adulthood, all had conflicting ideas on where their parents were born and at times, some of the children had inconsistent ideas on where their parents were born. I have had good luck by emailing the church in Germany, and just asking for the needed information. Of course my people were from smaller villages, so it may be more difficult trying to contact multiple churches in a larger city. I may try that with St. Pauli, Melissa, but wait to do a broader search until I see whether we can pry Marie’s birth record free from the Standesamt. Glad I am not the only one frustrated at not finding a record tonight. In the 1949 obit of my first cousin four times removed, his youngest child is listed as “Mrs. Charlotte Baer” and a resident of Toledo. I then saw on Find A Grave that there is a Charlotte Baer buried in Wood County, Ohio, just outside of Toledo, in the same plot as a Carl C. Baer. I then found a death record at FamilySearch for their son, Carl Arthur Baer, who was born in Jan 1944 in Toledo and died in Jan 1945 in Toledo. I also found Carl C. Baer’s WWII draft registration card at FamilySearch that stated he was still married to his first wife, Stella, and lived in Toledo in 1942. So if he was married to Stella in 1942 and Charlotte gave birth to Carl Arthur Baer in January 1944, it would seem reasonable that Charlotte and Carl C. Baer married c. 1943 (possibly 1942). Well, the marriage records for Toledo (Lucas County) are not indexed at FamilySearch. No big deal, though, because the images are available and I’ve narrowed down the date, right? Wrong. No luck. I even tried Wood County and expanded the years of my search in both Wood and Lucas County (perhaps they were not married until after the birth of the child). Still no luck. I think I have gotten too spoiled with being able to type in a name, click “Search,” and immediately find the result I was looking for. It’s frustrating when people don’t do what you know they did where you expect them to have done it, isn’t it, Jennifer? I mean, seriously, if you find out they were married in Las Vegas because he was stationed there, you have every right to be annoyed at his lack of consideration for not leaving records saying so!! Funny you mention Las Vegas because I have actually had luck finding the marriage record there at least three other times when all else failed. My other thoughts are Monroe County, Michigan (since Toledo is on the border and some of her other family members did marry there) and Indiana (no waiting period). 🙂 Good luck, then, in Las Vegas! A suspenseful story. And clearly SO frustrating. Two questions occur to me. First, how many Lutheran churches are there in Bremen? Second, the calculation of birth date. My own mother’s age on her death certificate was forward-dated at least a year, because she wanted to be younger. (I learned this from my cousin and a census report.) Maybe Marie’s mother, in the throes of grief, made some error in her infant daughter’s age? Good luck in your next efforts to track down this record. Surely you are the soul of perseverance!! (a) Forty Lutheran churches, give or take. and (b) The date of birth has to be pretty close, and I did go back all the way to the date of my grandparents’ marriage in 1918. But with the help of everyone here, I know I’m going to get her death certificate and may even be able to get her birth certificate, so that’s so much more than I could have hoped for!